This easy-store cheese board has all you need to make sure your guests leave your next party feeling full. Maximum spread with minimal footprint: That's what every good entertainer craves. 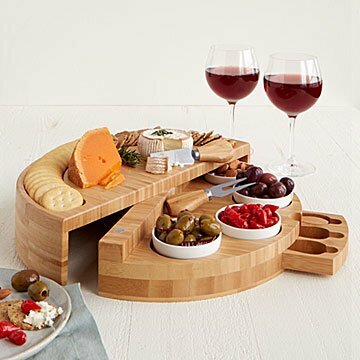 This collapsible cheese board delivers. With special sockets for ceramic serving bowls, a groove that keeps your favorite crackers contained, and a secret drawer stocked with three cheese knives, it's got just about all you need to make sure your guests leave your next party feeling full. The best part? It folds down to half its size, so it's easy to stow in your cupboard, too. (If you're wondering about the bowls, they fit inside.) Fruits, olives, chocolate-covered almonds… this thing accommodates 'em all. Now we're hungry. Made in China. Handwash and dry bamboo board & cheese tools, do not soak. Ceramic bowls are dishwasher safe.